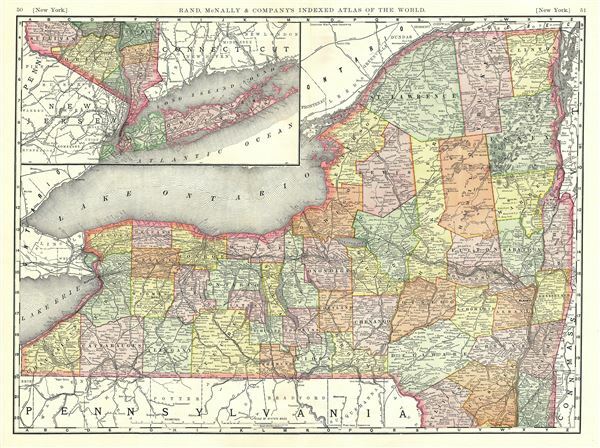 A beautiful 1888 map of New York by Rand McNally and Company. It covers the state of New York in its entirety with the southern end including Long Island featured in an inset in the upper left quadrant. The map is highly detailed and notes major towns, rivers, railways, lakes and other topographical features throughout. Map is color coded according to counties. This map was issued as plate nos. 50 and 51 in the 1893 edition of Rand McNally and Company's Indexed Atlas of the World- possibly the finest atlas Rand McNally ever issued. Rumsey 3565.073 (1897 edition). Philips (atlases) 1026 (1898 edition).